Daybreakers does not try to be Blade, Nosferatu or Dracula. Instead, it tries to be a small film about what happens when the entire planet is inhabited by vampires. Humans being hunted for their blood. Everyone works at night. Blood in your coffee and Chrysler daytime running black out windows. Everything is going along honky dory until, whoops, there’s only enough blood supply to last a month. Edward played by Ethan Hawke is in charge of creating a substitute while the world around him slowly crumbles. Turns out Vampires when not getting enough blood de-evolve into sub-vampires not as gory as those portrayed in Blade II but harken back to the type of vampires we’re all used to with wings and such. These sub-vampires could have been a great villain but instead their one appearance is kept to a small scale and instead hammers home the world Edward now lives in. Unfortunately, Edward’s cure is not found in his lab, much to his dismay but once he meets a few remaining humans, he comes in contact with Lionel ‘Elvis’ Cormac played by William Dafoe. Dafoe is one of the brighter parts of the film since everyone is either a vampire or the character arcs are miniscule. Edward’s boss, Charles played Sam Neill arc of getting his human daughter to turn ends with bloody results and the non-romantic arc with Audrey played Claudia Karvan, there’s really not much to talk about. 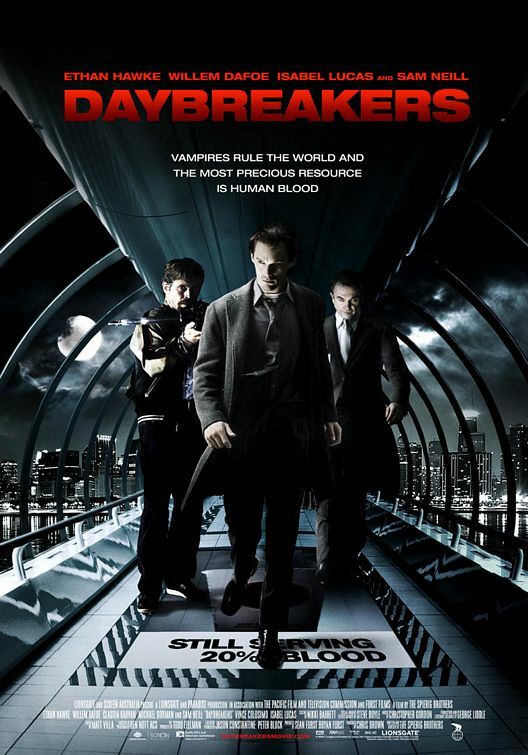 The plot of Edward’s brother, Frankie turning Edward was an interesting idea but we hear it we don’t see it and I think that’s what of the underlying problems, after a lovely start, Daybreakers doesn’t know how to end. Once Dafoe’s character and his backstory is introduced the film either gets better or worse depending on how much you nitpick this film. I won’t ruin it for you but after reading the script first months ago and now seeing the movie I still have a hard time believing the Spierig Brothers idea of turning someone back. Thankfully it does not include killing the vampire who turned you since that’s been done, pardon the pun, to death. Overall, the movie is still fun to watch once you realize the movie had turned into Star Wars with Vampires. ← Previous Previous post: Welcome to Hoth, R.I.
Next → Next post: [Gratuitous Image Post] Snowpocalypse….